The best gymnastics mats for home practice combine convenience with safety. There are lots of options out there, but this list contains some of the best ones. Picking out a gymnastics mat for home use can be overwhelming. When looking at the options, pay attention to how much cushioning they provide and what materials are used. Also think about whether or not you want a permanent practice space, where the mat can be left out. Otherwise, storing your mat is required. 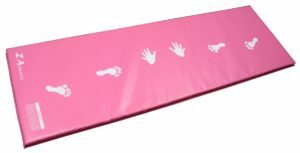 These mats should serve at home or in class, though the list is specialized toward using them to get the hang of gymnastics at home. This is because transporting these mats between classes and home can be cumbersome. 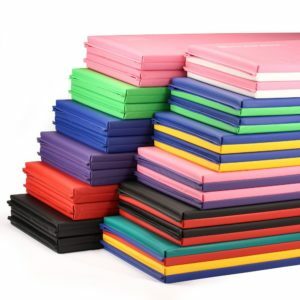 Gymnastics mats are heavy due to the padding, which is meant to provide cushioning for safe falls. The weight also prevents them from slipping out from underneath the gymnast. Also, in between classes it is important to have a dedicated to practice space for repeating movements. We Sell Mats (Amazon link) offers the best multipurpose mat. These mats come in vibrant colors and are optimized for use in a variety of activities. Beyond gymnastics, they can be used for other high-impact sports such as parkour and martial arts. These mats are easily combined to cover larger practice areas thanks to strips of velcro located on all four sides. This feature makes them ideal for use during intense cardio workouts or lower impact exercises such as pilates or practicing yoga. The mats are stuffed with polyethylene foam, giving them plenty of cushion to protect joints. The vinyl covering makes any necessary cleanup easy, and is resistant to puncturing and mold buildup. 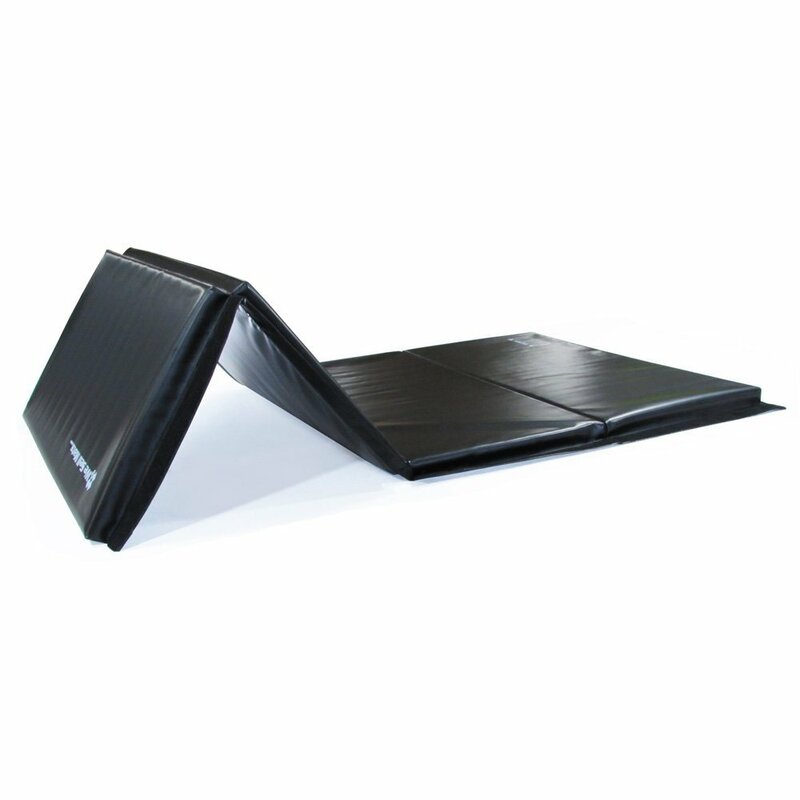 If not being used in a permanent exercise area, this mat can be folded up and stored. This mat varies from around $80 per section to $150. The mat comes in a variety of solid and two toned hues. For your convenience, it also comes in different dimensions and thicknesses. One thing to keep in mind is that while having several hooked together will eliminate the fear of the mat slipping on the floor, it will still require some care as the vinyl covering is not absorbent and is prone to pooling after use. The largest benefit of the Giantex Mat (Amazon link) is that it is affordable, retailing for less than $40. This is not the only benefit of this easily portable mat. Its design includes handles for mobility and velcro on two sides to combine with other mats. In use, the mat can be very hard, but it does provide enough cushioning for children’s tumbling and dance exercises. This gymnastics mat is also suggested for low impact exercises that are done on the floor. Like other mats, it can be conveniently folded to be stacked for storage when not in use. For use by adults or older children, it is suggested that two are purchased. This mat retails for between $30 and $35, depending on what color is desired. 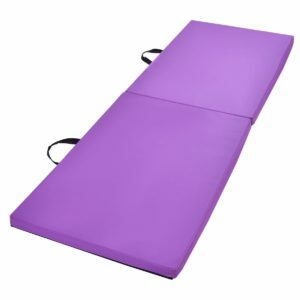 The Z-Athletic Gymnastics Training Mat (Amazon link) is the best one for practicing cartwheels. This is a child’s sized mat, so it is very small. However, it does include instructions for how to do one of the most basic gymnastic moves right on the mat. On one side, the mat features hand and footprints for an optimized cartwheel. The other side features a straight line that can be used to practice balance beam techniques. The mat is also easily cleaned up before and after practice, thanks to the heavy duty vinyl cover. After being unpacked, the mat may have a plastic smell until it is aired out. It also has to be folded for storage, but is without guidelines for this. This gymnastics practice option is best used in spaces dedicated to gymnastics practice, rather than stored between practice sessions. Another option is pushing it under a piece of furniture, such as a couch, so that it can remain flat. This mat is a midrange one, priced in the mid $50s or so, depending on sales and stock. When shopping for the best gymnastics mats, pay attention to how much protection is offered for tumbling around. Unlike pilates or yoga mats, these must be able to cushion a landing, and not just your joints. Another thing to keep in mind is how easily cleaned they are, and whether or not storing them in between working on gymnastics techniques is needed.